Sand Hill Farms has 100 calves sired by All Star.They are very pleased that calves show the growth and body type that was expected. All Star has proven him self thru ultra sound and actual carcass data to be a combination sire for both REA and IMF. 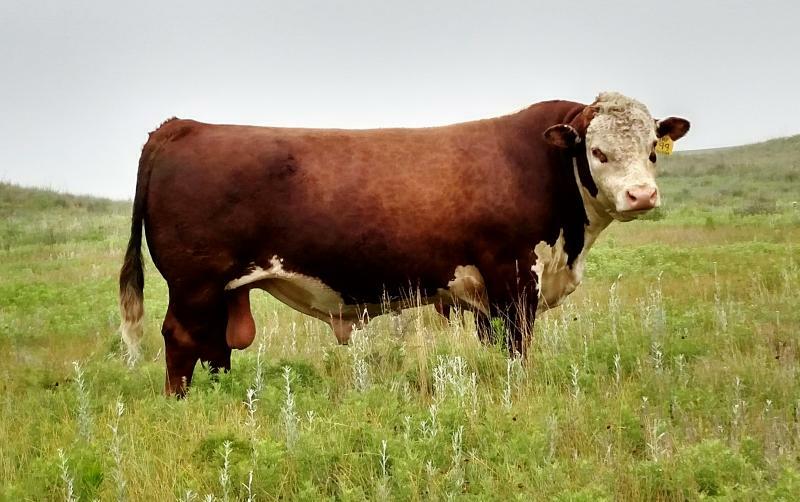 He is a very complete bull that will help improve all traits in cow herds. He ranks in the top 5% for all 4 of the breed indexes. From an individual trait standpoint. All Star ranks in the top 15% of the breed for Calving Ease and top 10% for YW. I honestly believe this bull's genetics need to be in most cow herds. His first daughters have now calved, and the udders for both teat and udder shape have proven this bull will fit the time tested quality of his sire 3027. How to use All Star: All Star should be used to hold the frame score even on the cows he is used on. He might add some weight to the mature cow, but shouldn't change the frame size. His daughters will improve their mothers. He will add carcass value for both carcass weight and quality grade. His Calving Ease is border line for wide spread use on heifers.